Photograph collection of webmaster D5112 near St Rollox Works, Glasgow on July 30th 1965, shortly after being released from an overhaul. The fifteen year ten month career of D5112/24112 began with ten years & eight months allocated to Eastern Region depots before transferring to the Scottish Region for the remaining five years. Time between last Classified repair and withdrawal: 26 months. 24112 was stored at Millerhill from October 1976 until moved on June 17th 1977 with 24113 to Doncaster Works, where 24113 was broken up during October 1977. Noted Darlington Works August 1961. Noted Darlington Works June, August & September 1962 (collision damage). Noted Darlington Works May 1964. Noted Glasgow Works May - July 1965. Noted Glasgow Works May 1971. Noted Glasgow Works September - October 1974. Photograph courtesy Keith Long. 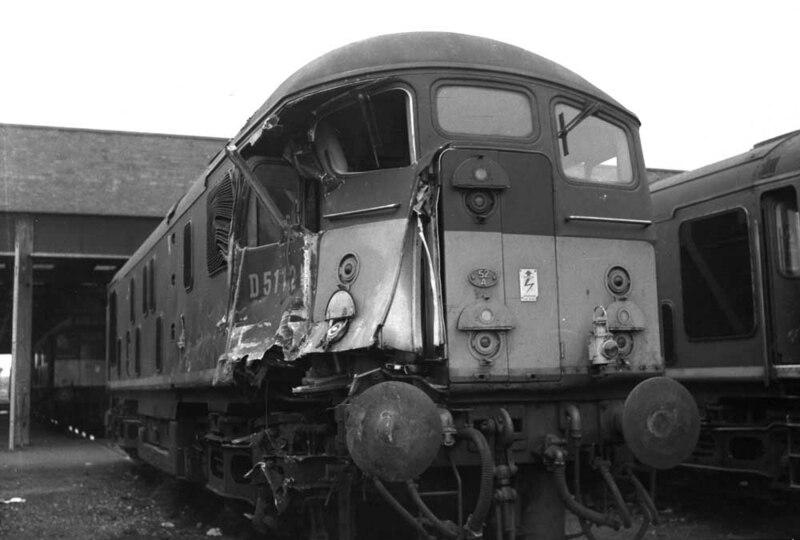 D5112 with collision damage at Thornaby on October 21st 1962. It would appear that following the repair of the No.2 cab, the frame level stripe was not applied to the cabfront. Double headed Gateshead Type 2s worked the Saturday’s only Newcastle - Ayr - Stranraer passenger in both directions. So noted in June & July have been D5097/5112 (24th), 5149/5112 (1st), 7601/5149 (8th), 7611/5051 (15th) & D5101/5112 (22nd), ScR examples filled in, especially on the eastbound runs after failures had occurred. Condition July: green livery with small yellow warning panels, curved upper corners, frame level stripe is not present on cab fronts, steam style shedplate on cab front, blanking plates fitted, hand/footholds present, shortened fuel tank, full size water tank, three-rung bogie mounted footsteps, ridge sided sandboxes. 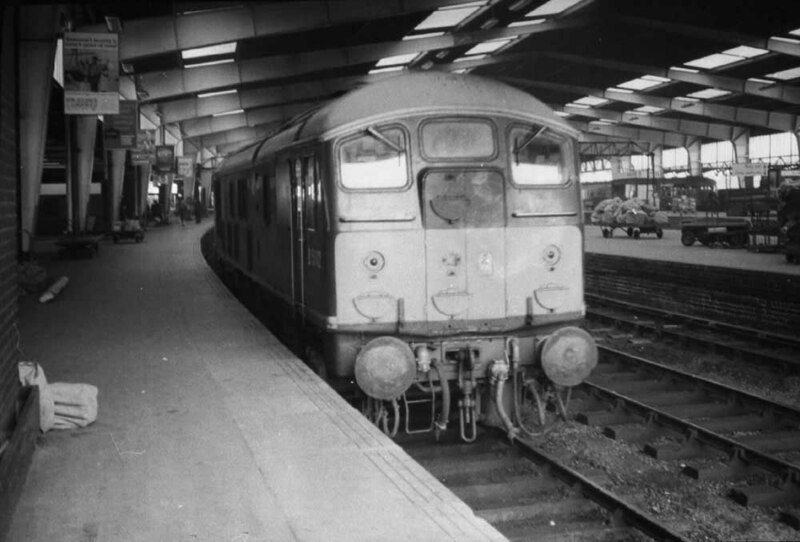 Photograph collection of webmaster 24112 at Leeds during October 1967. This view shows how St Rollox did not continue the frame level stripe across the cabfront during its repair & repaint in 1965. Although this January was a remarkably mild one heavy snowstorms on January 9th & 10th brought considerable chaos to many parts of the country. Particularly hard hit were the London commuters with most of the termini suffering many cancellations due to frozen up equipment. Perhaps because of this it was no surprise to find Holbeck based D5112 at St Pancras on 9th. During August 5112 entered Derby Works for overhaul. It is presumed it transitioned from green to blue/yellow livery during this visit. A shortened water tank was added, with both the fuel & water tanks now being fitted with circular gauges (non BIS side). The gangway doors were retained, and the then standard two BR emblems on the cabsides and the two numbers on the locomotive sides were applied. Only the frame level valencing above the battery boxes was removed. On April 2nd at noon 5112 was noted at Malton with DE900271, a maroon inspection saloon. During August the SO 11.00 Filey - Huddersfield ran entirely with ER power with 238 (1st), 5096 (8th), 5180 (15th) and 5112 (22nd). 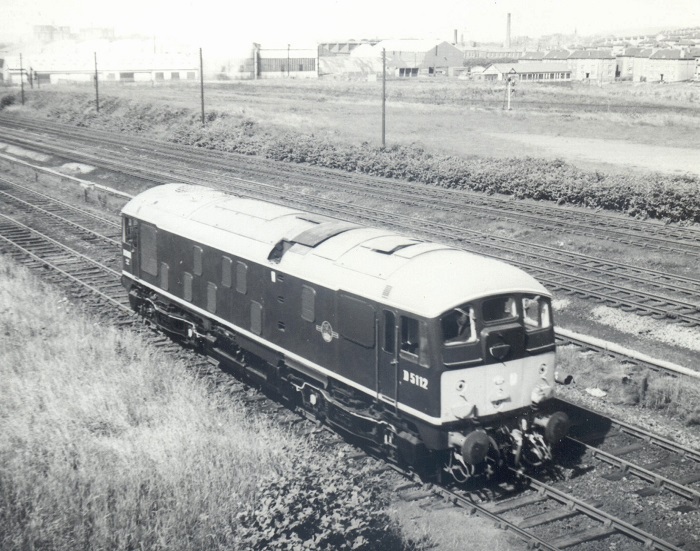 In Scotland the conversion of the Glasgow – Dundee service to diesel multiple units led to the Glasgow Works ‘testing’ train becoming the 08.35 Glasgow – Oban service. 24112 was noted ‘on test’ on this train on October 22nd. Photograph courtesy Tony Sayer. 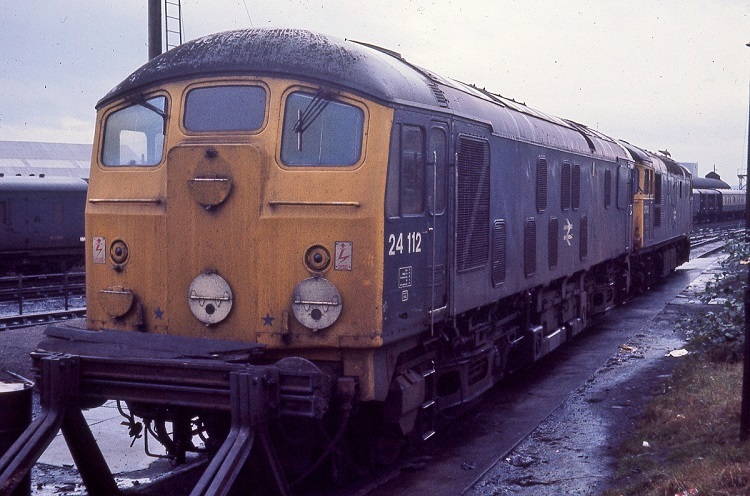 By late 1974 the writing was on the wall for the Class 24s, with Classified repairs to the Class drawing to a close. 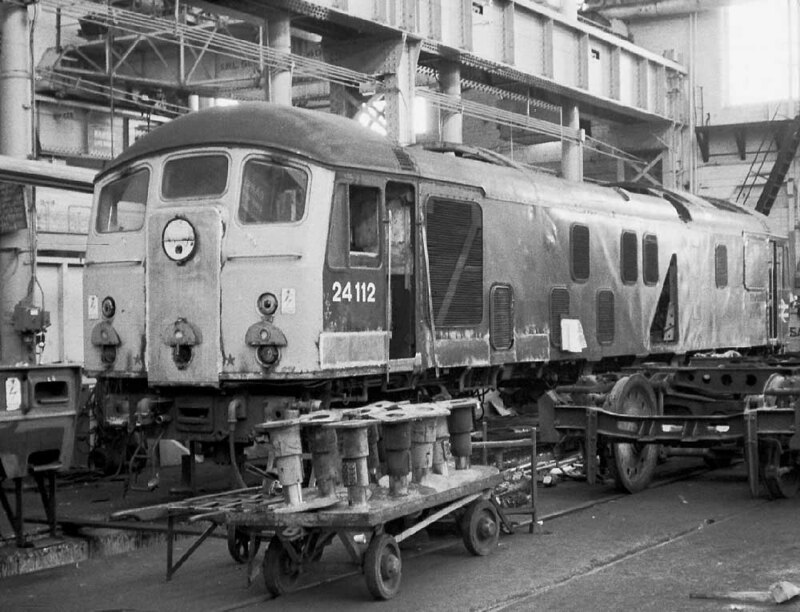 Here is 24112 at Glasgow Works on September 26th 1974 udergoing bodywork repairs. The gangway doors have been sheeted over and the headcode discs centered on the cab front centerline. This would be the last summer for the Scottish Class 24s with their demise imminent since more Class 25’s were expected on transfer from the Western Region. 24112 was noted on July 18th at Perth on a ballast train. On August 10th 24112 came to the assistance of 40123 at Dalwhinnie working the 09.35 Glasgow/Edinburgh – Inverness service (also reported as 40027 with 24112 & 26009 assisting to Inverness. On August 27th 24112 was stabled at Perth station. On an unknown date during August 24112 & 24150 were noted passing through Princes Street Gardens to take up an Edinburgh - Aberdeen train. 24112 was noted at Ayr on September 9th and at Inverness on September 25/26th. On October 14th 24112 worked the 06.45am Carstairs - Edinburgh passenger. 24112 at Inverness on September 26th 1976 with about a month of active service left. The Class 24 is in typical Scottish condition with centered headcode discs and the blue star coupling symbols inboard of the lower headcode discs. The cantrail level water filler is still extant but the hand/footholds have been plated over. Condition Final: blue/yellow livery, gangway doors sheeted over, headcode discs centered on cabfront, shortened fuel and water tanks - both equipped with circular gauges, blanking plates fitted, hand/footholds plated over, three-rung bogie mounted footsteps, both types of sanboxes fitted. 24112 was withdrawn on December 31st 1976.